At the beginning of each new semester or school year, teachers are faced with the challenge of remembering names for a large number of new students. 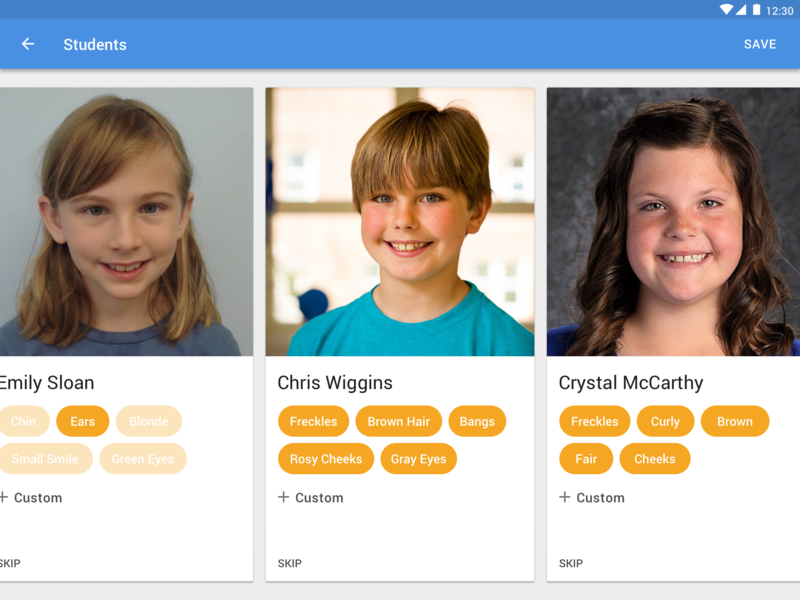 I needed to design an experience that would help an educator match faces to names, with the goal of shortening the time needed to reach complete un-aided accuracy. A quick Google search shows that this problem is experienced by almost all teachers. On their first day of class, some teachers will see up to 100 different faces rotating through their desks. I personally have never had to memorize such a large number of names in a short amount of time, so I decided to interview teachers who are more familiar with the problem. Can memorize the names by the end of the first day. Other teachers it takes 1-2 weeks. 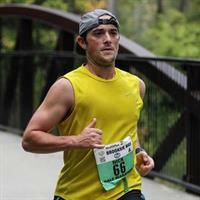 Has access to students photos beforehand. Uses repetition and word association. Say, Brian has blonde hair. Brian/blonde. Some names are very similar. Have to work specifically at getting these correct. Aleya/Alaya. The biggest take away from these interviews for me was the desire for them to know all of their student’s names on or before the first day. Both teachers were able to see immediate benefits when correctly using a student’s name, providing a great initial connection. In addition to the interviews, I also wanted to understand which strategies are most effective for remembering names. I began reading through research journals on scholar.google.com and noticed one that was consistently being cited. Memory for Proper Names by Gillian Cohen and Deborah M. Burke detailed a series of name memorization studies. In those studies, they discovered one strategy that was most commonly reported as being used by both younger and older adults. That strategy was to “find a distinctive feature of the face and relate it in some way to a meaningful elaboration of the name.” This fact was also brought up when I interviewed Nick. 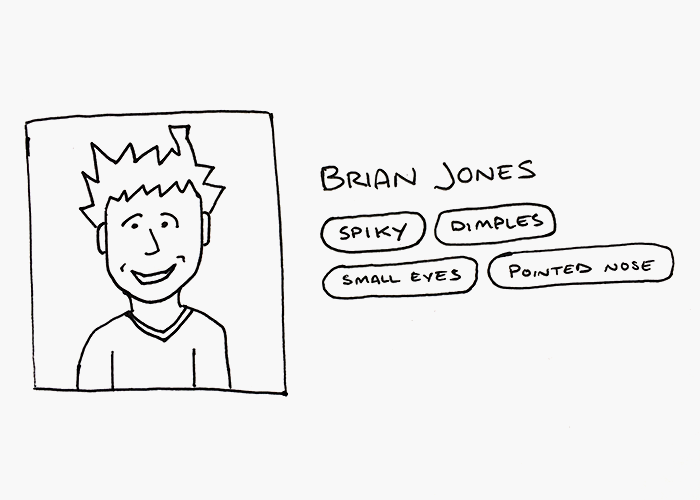 The student’s face is a unique identifier, and highlighting a unique facial feature would provide them with that meaningful connection to their name. With all of this research completed, I decided to write down a simple list of objectives that I should focus on achieving. These objectives would help to be my North Star during the ideation process. They’ll provide a level of constraint that helps keep me focused, and of validation to make sure the user’s needs are being met. On the first day, provide a photo booth for students to interact with. The students would be able to select their name, then choose an animal to slightly morph their face into. The teacher can then use these photos during their lectures. They can select (or random) a student from their tablet, and that student’s picture would be cast onto the television. 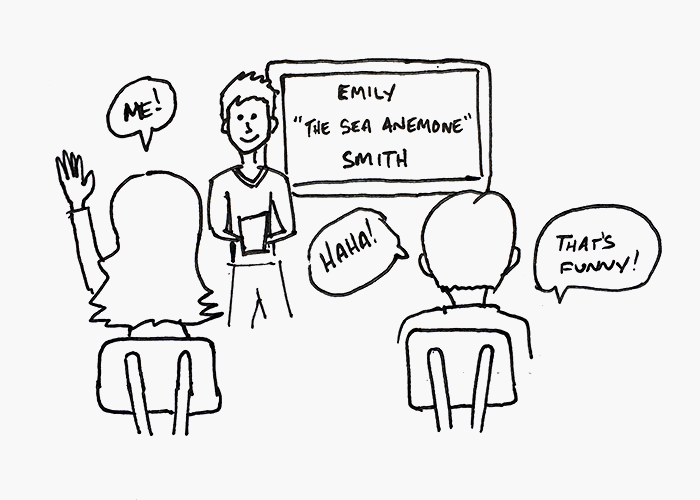 The entire experience would be fun and humorous for the students, but also provide the teacher with a memorable connection. Create a rhyme generator that takes a student’s name and connects it with rhyming words. During the first roll call, the teacher can cast the rhymes to the TV. This will help break the ice on the first day by adding an element of humor and to help both the teacher and students remember each other. 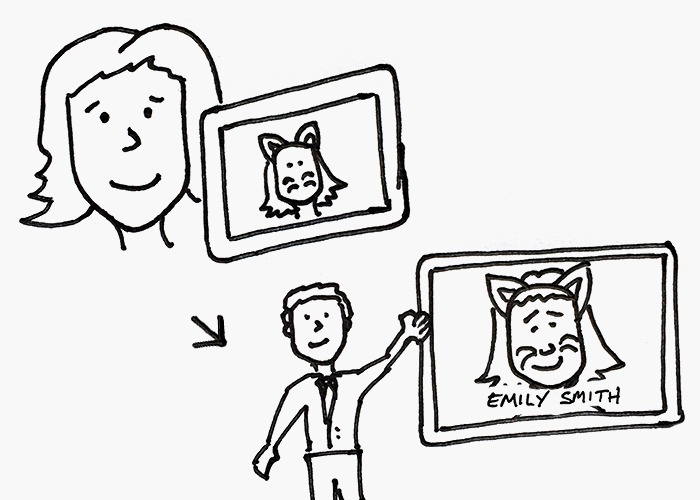 Import the student ID photos, and require the teacher to tag a prominent facial feature of each student. Then, using the Street View photo capturing capability, the teacher can photograph their classroom and create an assigned seating chart. If the teacher needs additional help with memorization, they can take a quiz using the photos and facial tags. Upon completing the ideation phase, I compared each idea against the objectives I created. The third idea did the best job of simply connecting faces with names, and it provides additional tools that would assist the teacher with memorization. I decided to move forward with this idea, and begin designing the UI. The experience consists of four primary functions, Importing, Tagging, Seat Assigning, and Quizzing. Importing students and their photos is the first required action, as all other functions rely on this. 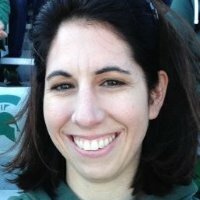 Both of the teachers I interviewed stated that student’s names and photos are easily accessible to them, so we’ll provide options to connect with the school’s database, import from their computer or capture directly using the camera. Once all the content has been imported, we’ll require the teacher to look at each student’s photo and tag a distinguishable facial feature. It’s this step that was referred to as being the most helpful for name memorization. By completing one card at a time, the teacher can focus on each student individually. Google’s facial recognition technology could assist with generating relevant tags for the teacher to choose from, or they can add their own. The first few days of class will be the hardest for teachers. 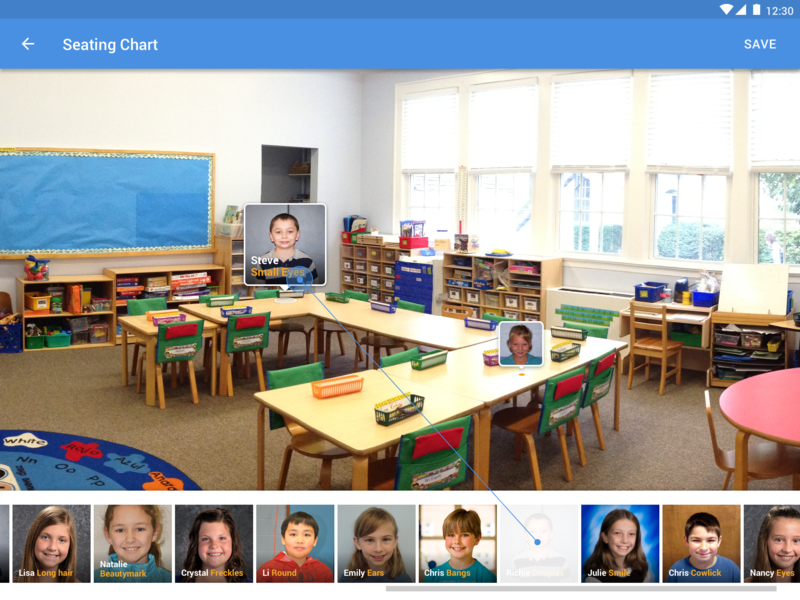 To help add an element of consistency, they can create a seating chart using a photo of their classroom. The camera feature from the Google Street View app would allow the teacher to add a wide, interactive image from the perspective of their desk. Then they could drag each student’s tile onto the image to create a seating chart. The students will always be displayed using the “[First Name] [Tag]” connection to continuously rely on the memorization strategy. If the teacher needs additional assistance, they can take a quiz to test their memory. The quiz will provide a quick multiple choice walkthrough of the class roster, and help pinpoint which names the teacher is having difficulty with. In conclusion, this experience does a great job of quickly assisting teachers with name memorization. However, in its current state teachers will only utilize this tool for a week or two. With that in mind, we should look to include other areas that’ll reduce the tedious tasks of teachers, and allow them to spend more time focusing on the students.